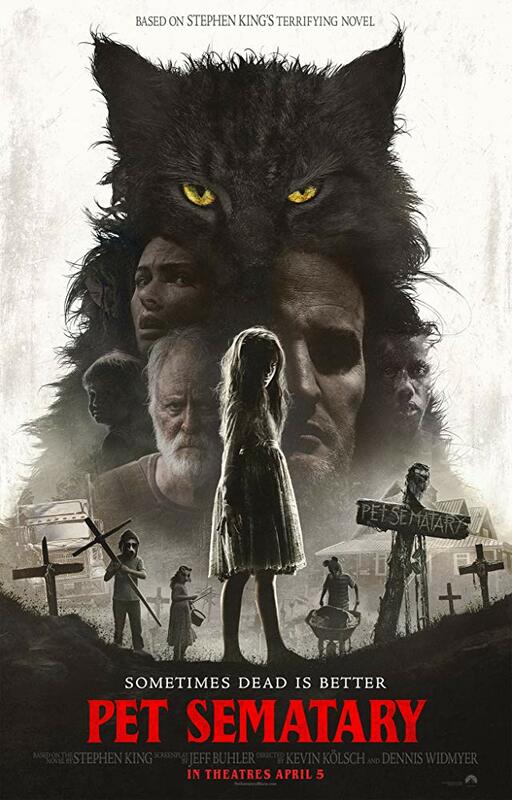 With Pet Sematary 2019 I was bracing for a bad movie because I enjoy the original so much, although much of that is nostalgia. Even though I was guarded, Pet Sematary proved itself to be a stellar remake that I would venture to say was better than the original. This remake used the first movie as a foundation to build a familiar but different enough movie that had lots of call backs, and was, in many ways, a response to the original. The crux of the plot, however, relies on what lay beyond yonder Pet Sematary. A Mic Mac Indian burial ground holds the secret to resurrection. After the loss of a family cat “Church” Jud takes Louis to the Indian burial ground which has the unique feature where whatever is buried there will come back to life while the feline resurrection saves Elle the grief of losing her favorite cat. The knowledge of a power to restore life is a Pandora’s box that only results in misery for the Creed family. This movie surprised me in a lot of welcome ways. It was similar enough to the original that it felt like you knew what was coming, which would be boring. The great part of this remake, it twisted and moved around your expectations to surprise and titillate. There were moments where you were sure you knew what was going to happen, the setup was there, and then nothing – a deep breath. Other places where You expected A and got Q – who expects Q? If you want the bare bones of how Pet Sematary spoilers play out, I would suggest listening to the episode of HMT right before this one, where we talk about the original Pet Sematary from 1989. The spoilers section on the remake is mostly going to be talking about how the remake differs from the original, things that it did well, and where it could have been better. Pet Sematary begins with Ellie finding the pet sematary because she saw a procession of children walking on her property down the path. In the original movie, Jud brings the family to the cemetery, which kicks off the whole downward spiral. This is relevant because it shifts a bit of the blame from kind, old Jud, to no one in particular. This is kind of like, “Han shot first” in Star Wars. In the original cut, Han shoots Greedo in Mos Eisley, implying that he is a bad man, a murderer. In the late 90’s re-release, they changed it, so Greedo shot and missed Han, implying Han was a good guy all along. This is a fundamental character shift, and while it’s not as weighty in the Pet Sematary remake, I think it’s at least relevant. A great side-by-side comparison of the Han shot first debacle. Jud takes to Ellie and begins to form a relationship with her, the kind, old man has a soft heart for the little girl next door – it’s sweet. John Lithgow does the role of Jud proud, which means that I have to eat my words from our review of the original Pet Sematary. The Zelda sub-plot in this is much better in every way. Zelda was the older sister of Rachel, and she had some kind of horrible degenerative disease, and Rachel has lots of flashbacks to being a little kid who had to take care of her terrifying older sister. To make matters worse, in this movie, Zelda resents Rachel for not having a degenerative disease and seems to wish her harm. The scares surrounding Zelda are probably the most intense scares in this movie, and while many of them are jump-scare oriented, the tension is built quite well. Zelda’s death in this Pet Sematary is truly upsetting, and something that would haunt a kid forever. The flashback that Rachel experiences is her being left home alone with Zelda again, and being responsible for feeding her dinner. Because she doesn’t want to see Zelda, she places the food in the dumbwaiter and sends it up to Zelda automatically. You can hear Zelda approach the broken down dumbwaiter, and soon you hear her fall into the shaft. This is a shocking moment, and it’s well executed. The Victor Pascow sub-plot was vastly different as well in that there was much less of Victor. This worked well because frankly, Victor was a distraction. In this movie, Victor basically introduces Louis to the Indian burial grounds. The most compelling difference between the two – this one has good acting. Everyone was a person who acted as they should and weren’t irritating or distracting. Keith’s blog discussing if the remake should have been made. One big twist in this Pet Sematary is that Gage isn’t the child they lose – it’s Ellie. I thought that this worked well given the friendship between Jud and Ellie, and it provided a super fresh take for the audience who patently expected Gage to die during that memorable scene. Ellie comes back to life, and Louis decides to bathe her because of how gross she is, having been buried twice. As he is bathing her the staples from her stint being prepped for burial the first time are present at the back of her head. Ellie behaves erratically, dancing to the Nutcracker Sweet. Eventually she goes too far an does what the undead tend to do in horror movies. Pet Sematary (2019) is a response to the original Pet Sematary, and it’s made better by watching the original first.